Ok, if you haven't seen The Hunger Games and haven't read the entire trilogy and don't want to be spoiled, you should stop reading now. The Hunger Games has just come out on DVD, so I thought I'd share some reflections that have been floating around in my brain since I saw the movie and read the books. 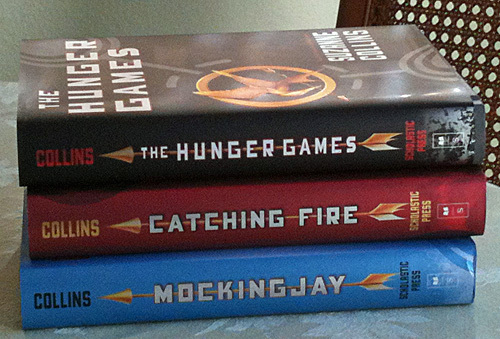 When I first saw The Hunger Games, I hadn't read the books. I didn't want to see it really, I'm not fond of violent films, but it was getting really good reviews so we went. I found the movie disturbing. I realized that by watching the "games" part of the movie and rooting for Katniss, Peeta and Rue, I was participating (in a sense) in condoning the murders of the other child contestants, even the ones who were made almost inhuman by their training. It made me extraordinarily uncomfortable that watching this, even as pretend, was remotely okay with me or anyone else in that theatre. But the books don't just stop at making you uncomfortable about how reality shows are veering closer and closer to horrible violent ends for their contestants (have you seen the promos for the military reality show?). I read the trilogy after seeing the movie. I wanted to know what happened next. And nothing was clearer than Panem had become a nation where humanity has no worth. None. They are either in the districts working as virtual slaves, or in the Capitol being utterly distracted by the bloody entertainments of the Games. Human life has no worth. There's no God in these books, not even called upon by those oppressed most in need of a god. There is no God because there is no hope. "May the odds forever be in your favor" is the closest to some sort of hopeful affirmation and even then it is either said utterly vacuously (by the Capitol citizens who treat it as a cheer) or with a despised sneer. In District 13, human life has no worth. The rebels became that which they wanted most to destroy. That scene of children captured in the square at the end of book three made that perfectly clear. Katniss, symbol of the revolution, now represents the same evil that has oppressed and abused her entire young life. It's no wonder she went crazy. So can we still consider Katniss a hero? She is a survivor and has had to make decisions and choices no one of her age should have to make. In many ways she is a product of her environment, except one. She sees worth in others. In the small and weak, like her beloved Prim. Like Rue, whose smallness and weakness didn't make her a good ally in those Games, but Katniss saw Rue's gifts, her resourcefulness, and most importantly, she sees valuable life in Rue. In Rue's family, in which she sees her own family. In the dispossessed, like the Avoxes who serve her. Who have names. Katniss cares about that -- and feels guilty that she couldn't rescue the girl when she first encountered her. They aren't slaves to her. They are people. For this, even though she's hoodwinked by the dream held out by the rebels -- and honestly, weren't we all hoping Panem would change with the President out of power? -- Katniss is still a hero because ultimately she refuses to let the status quo of life having no worth to stand, even though her decision and action destroys her. The Hunger Games are a cautionary tale, one we should well heed with our nation's love of reality shows, of seeing so much violence again and again that is shocks us less and less. What we should do about the way things continue in the "entertainment" world, I don't know. I don't have the answers there. But there is one thing we can do. Like Katniss, and like Peeta, we can act to show we believe human life has worth. Don't know what that would look like? We'll continue this in a post on Friday. Have some ideas on how we can do that? Share them in the comments! Thanks for this perspective on Katniss. I was really frustrated with her because I felt she never chose to be the hero - it was only pushed on her. This was great and made me think. Thank you. Christy -- you're welcome. Poor Katniss really was a pawn in the bigger game, wasn't she? Every time she thought she was breaking out of it, it just got her deeper into it.